In its tenth year of elevation from a division of the Faculty of Arts and Sciences, the cutting-edge School of Engineering and Applied Sciences got its own, very traditional, orange/gold crow’s-foot device for master’s degree students’ gowns this year. And honorary-degree recipients’ triple crow’s feet were restored after an inexplicable three-decade-plus omission. Commencement aficionados can learn more at harvardmag.com/regalia-17. Departing from tradition, all Harvard Law graduates (above) won a one-year dispensation to wear puffy tams rather than mortarboards, to mark the school’s bicentennial; that headgear is typically the prerogative of Ph.D.s and equivalent degrees like the S.J.D. (law), D.B.A. (business), and Ed.D. (education). 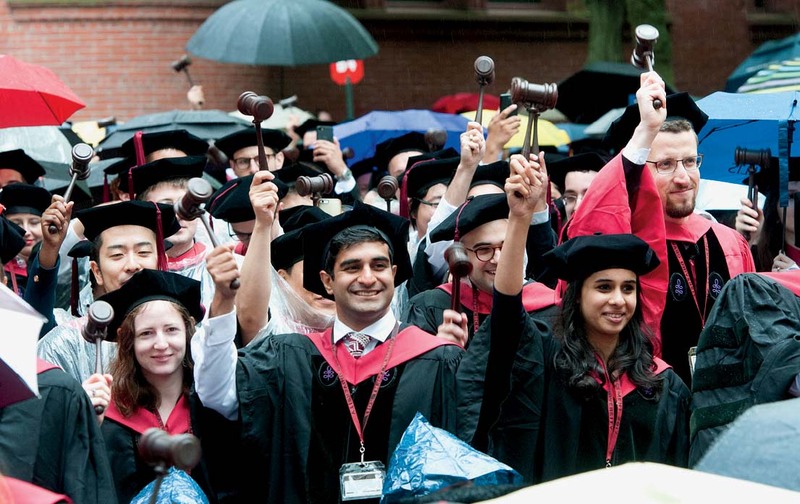 The Harvard Crimson’s senior survey (to which 790 students, about half the class, responded) reveals that among graduates heading for a paycheck, “In keeping with past classes, most working graduates will join the consulting, finance, or technology industries, which have drawn 18, 18, and 16 percent,” respectively: 52 percent of those about to begin employment. That brings to mind the meme (described by The Undergraduate) of the Harvard-bound baby’s first word: “M-m-m…McKinsey and Company.” Separately, among survey respondents “23 percent reported having cheated in an academic context at Harvard” (up from 17 percent, 19.5 percent, and 21 percent in the prior three classes)—a depressing tally that provided some context for the Crimson’s reports about a large Honor Council investigation into alleged academic misconduct among students enrolled last fall in the popular Computer Science 50 course. President Faust having conferred M.B.A.s on the Business School candidates, their dean, Nitin Nohria, added a shout-out from the Commencement platform to his daughter, Reva, minutes from receiving her bachelor’s. Provost Alan Garber, who leads the degree-conferring continuity, refrained from similarly embarrassing/delighting his son, Ben. Other parents with College class of 2017 progeny included dean of science Jeremy Bloxham (son William) and senior associate vice president Robert Cashion, effectively the chief fundraiser for the Faculty of Arts and Sciences (son Nicholas). The fiftieth-reunion class of 1967 is, characteristically, studded with successful leaders, some of them importantly involved with alma mater, including two Corporation members: Joseph J. O’Donnell and Jessica Tuchman Mathews. Also attending the festival rites were Harvey V. Fineberg (and M.D. ’71, M.P.P. ’72, Ph.D. ’80!) past dean of public health a nd Harvard provost, and actor John A. Lithgow, Ar.D. ’05, honored this year for founding and leading Arts First. But it is a safe bet that none of them can match the long Harvard service of Bill (okay, William R.) Fitzsimmons ’67, Ed.D. ’71, dean of admissions and financial aid since 1986 (left), who has known thousands of undergraduates from before they were undergraduates; and Thomas A. Dingman ’67, Ed.M. ’73, who as dean of freshmen has settled the newbies since 2005—the latest post in 44 years of study and administration here during the past half-century. Among the innovations this year were brighter, higher-resolution video screens for the throng seated farther back during the Morning Exercises (Harvard retained a new audio-video vendor), and a question-provoking device attached to one of the video-camera stands in Tercentenary Theatre: a security cam? a Facebook Live device? Nothing so exotic: merely a new robotic camera for Harvard’s AV/news team, capturing panoramic images. Next year, e-tickets, anyone? As any newspaper or magazine publisher knows, Alphabet (Google) and Facebook vacuum up most of the new digital advertising (and a good deal of clients’ former print dollars as well). But physical product promotions live on, if only in banner form, as attested by this welcome from the Harvard Alumni Association to graduate- and professional-school students queuing in Sever Quad for the morning exercises. The University awarded 7,066 degrees and certificates on May 25. Among the notable figures were 1,541 degrees in the College and 362 Ph.D.s. The Business School conferred 930 M.B.A.s; there were 857 diverse Extension degrees; 720 degrees, principally at the master’s level, in the Graduate School of Education; 561 degrees from the Kennedy School; 781 in law (including 602 J.D.s); 378 in engineering and applied sciences, and 353 in design; 233 in medicine and 640 in public health. The bicentennial divinity candidates earned 106 degrees, and the sesquicentennial dentists totaled five dozen plus one. Harvard boasts of the human connections it enables. Despite their combined 12 decades or so of acting, honorands Dame Judi Dench and James Earl Jones reportedly met for the first time at Commencement. Notable guests at Commencement included Uganda prime minister Dr. Ruhakana Rugunda and his wife, Jocelyn Rugunda, present for son Kwame’s M.P.A., and New York governor Andrew Cuomo, whose daughter Cara Kennedy-Cuomo (a government concentrator!) got her A.B. On Thursday, when it came time to confer degrees, Graduate School dean Xiao-Li Meng, the rare statistician known for his humor, departed considerably from the script. Having paused to elicit Ph.D. candidates’ cheers and applause, then thank them for their efforts, he said, “To return the favor, I want to double-check with each of you whether you really want this degree, because many of you realize this is your last chance to be a Harvard dropout”—a sly reference forward to Mark Zuckerberg, one among many zingers directed at the honorand and afternoon speaker (who made several sharp jokes at his own expense, too).